Slip into the Only Elephant Print Zip Back Sleeveless Jumpsuit for a chic cover up look. 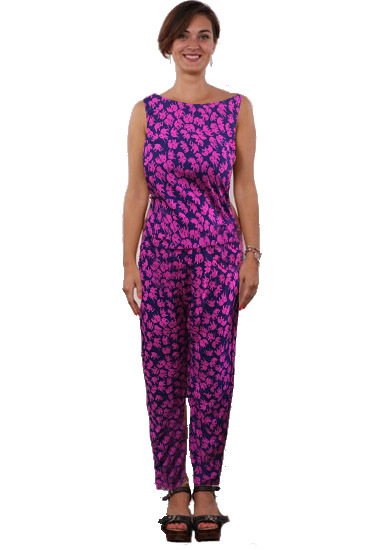 With its fashionable jumpsuit design, the Only Elephant Print Zip Back Sleeveless Jumpsuit cover up is a summertime staple that pairs beautifully over all kinds of bathing suits. Light and cozy, the style never clings or sticks, making it a go-to number for women seeking an airy feel. This number slips on over the body easily and has a cinched middle that beautifully highlights curves. A gorgeous elephant print decorates the jumpsuit, boasting island hues of blue and purple. The Only Elephant Print Zip Back Sleeveless Jumpsuit makes you jump for joy – and not just in your vacay photos.